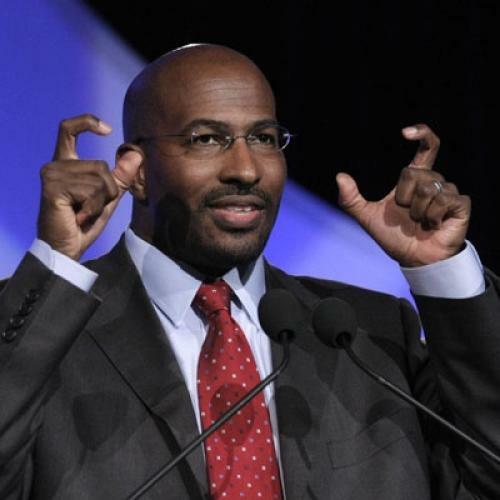 For months now, various right-wing bloggers and Glenn Beck have been trying to whip up outrage over Van Jones, Obama's green-jobs guru. Their accusations to date—that he's a secret communist, say—have been absurd and easily ignored. But all of the sudden Jones may be turning into a real political headache for the White House. Yesterday, he had to apologize for an old YouTube clip in which he called Republicans "assholes" for thwarting environmental legislation. That alone might be more amusing than inflammatory if it weren't also for the fact that, today, a conservative blog dredged up evidence that Jones had signed onto a 9/11 "truther" petition back in 2004. Naturally, Fox News was on this story immediately, as was Glenn Beck, who, on his show can often be seen flogging a Beautiful Mind-esque chart showing Jones to be at the center of a supposedly vast crypto-communist plot. True, there's no small irony in the fact that Beck of all people is accusing someone else of believing in zany conspiracies, but even so, it's not hard to think the right could end up winning this particular fight. If Jones does get pushed out, though, perhaps the even bigger irony here is that he's always been more effective and influential as an outside activist than as an administration official. Having followed Jones since he was a relatively unknown advocate for green jobs in the Bay Area, it seems to me that he's actually had less impact over the energy debate from his current post at the Council for Environmental Quality than he has at many other points in his career. 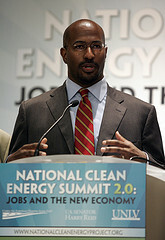 Jones, after all, hit the national scene in 2007 when he worked with Nancy Pelosi to get the Green Jobs Act included in the energy bill. He was soon being profiled in Time, The New Yorker, O Magazine. There was a point in 2008 when he was the keynote speaker at nearly every major liberal summit, from Netroots Nation to Take Back America, and seemed to be more skilled at eliciting enthusiasm for climate action than anyone else in the country. Indeed, when Jones joined the administration last March, many environmentalists worried that were losing their most charismatic and visible spokesman. Those fears have, to some extent, panned out. Jones's most public appearance in the past few months may have been when he stood up at a White House press conference to ask the gathered reporters to silence their cell phones (he had no further remarks to make). Instead of playing a leading role in drumming up support for clean-energy polices—something he was extremely effective at—he's now a relatively low-level bureaucrat trying to steer stimulus funding toward green-job programs. In all honesty, Glenn Beck may have more to worry about with Jones outside the White House than in it. In recent days some in the news media have reported on past statements I made before I joined the administration—some of which were made years ago. If I have offended anyone with statements I made in the past, I apologize. As for the petition that was circulated today, I do not agree with this statement and it certainly does not reflect my views now or ever. My work at the Council on Environmental Quality is entirely focused on one goal: building clean energy incentives which create 21st century jobs that improve energy efficiency and use renewable resources."